Among the best Spain beach insider tips, the Costa Blanca area is known for the beauty of its beaches, hence the name “White Coast”. There is something to please everyone on its beach vacation- lively bustling resorts and quiet secluded coves. Playa de la Levante – Benidorm (see video here) is famed for its beautiful beaches. This beach has about 2km of fine golden sand and can be very busy in high season. It is within walking distance of the town and is easy to get to. This beach has a Blue Flag award and is known for its calm sea and safe bathing. Beach Facilities: Thousands of sun-loungers and shades for hire, a variety of bars and restaurants along the lively promenade, Lifeguards, toilets, activities arranged for children, play areas, boardwalks for disabled access, raft with diving board area and slides. Water skiing, scuba diving, jet skiing and para gliding are all on offer. Playa de Poniente, Benidorm Beach – A quieter beach of about 3km of golden sand with areas of palm trees. It is situated by Park Elche, a lovely park to relax in when you have had too much sun. Facilities: A tourist train runs from the Park Elche to the end of the beach, a promenade offers bars and restaurants, good disabled access, Red Cross, Lifeguards, toilets and showers, public telephones and a clean beach. San Juan de Alicante beach, northern Alicante – Some say that this is the best Spain beach in the Alicante province. 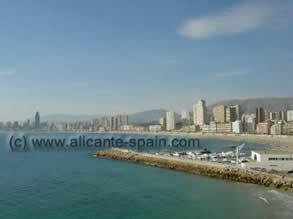 Situated to the north of the city of Alicante in the town of San Juan it is easily accessed by car, bus or tram. The beach is huge covering an area of about 7km and offers fine, golden sand. It has a Blue Flag award. Facilities at Alicante Spain beach: Hire of sun-loungers, shades and pedaloes, bus station, parking, toilets and showers, beach bars and a promenade lined with restaurants, play areas for children and areas for sports like volleyball, Red Cross, Lifeguards, nearby campsite and the beach is accessible by the disabled. There is an 18 hole golf course nearby. Les Marines Beaches, Denia Beach – These beautiful beaches cover about 2.7km and can be found to the north of Denia off the Carretera Les Marines. They have fine golden sand, calm sea and have been awarded the Blue Flag award. Facilities of this Denia beach: Sun-loungers, sunshades and pedaloes can all be hired, lifeguards, the Red Cross, parking, bus station, board walks for disabled access, toilets and showers, public telephones, play areas for children and an area for volleyball. There are many beach bars and restaurants along the promenade. Beach of Les Rotes, Denia Beach – Also to the South of Denia, this is an area of beaches of golden sand and rocks stretching to about 4km. It is situated off the “Carretera del Barranc del Monyo a Les Arenetes” and is renowned for its beautiful rocky coves and the fact that it borders with the Parque Natural de Montgo, a wonderful nature reserve. Its beaches also have a Blue Flag award. The Zona La Cala creek is a nudist beach. Facilities: Parking, bus station, board walks for disabled access, lifeguard, the Red Cross, toilets and showers, public telephones. There are various beach bars and restaurants. This area is also good for scuba diving. Les Deveses Beach, Denia – This area of the Denia coastline is over 3km in length and is made up of golden sandy beaches with dunes and then pebble beaches in the south. The beaches have the Blue Flag award and there is an area for water sports such as kite-surfing and windsurfing. It is also suitable for sailing. Facilities: Sun-loungers and sunshades can be hired, parking and bus station, Red Cross, Lifeguards, boardwalks for disabled access, area for sports like volleyball, toilets and showers, promenade, beach bars and restaurants, public telephones. La Granadella, Javea Beach – A beautiful pebble beach of 220m in length nestled in a creek and surrounded by pine trees. This amazing beach is only accessible by car on a road that winds its way through pine forests – a lovely drive. Beach Facilities: The creek is home to the Javea Sailing Club and also offers good diving. There are good facilities for the disabled, toilets and showers, parking, the Red Cross, Lifeguards, public telephones, restaurants and beach bars. Playa La Caleta, Villajoyosa Beach – This beach is a small beach of 160m of lovely golden sand and beautiful clear blue water. Facilities: Parking, bus stop, good disabled access, Red Cross, Lifeguards, toilets, beach bars and a sports area for volleyball. Water sports are offered by the local Club Nautico. La Roda, Altea beach – this beach is next to the beach of Cap Negret. La Roda offers golden sand, stretches to about 1.4km and has a Blue Flag award. The sea is amazingly clear and blue and many water sports are on offer. Facilities: Parking, bus station, toilets and showers, Red Cross, Lifeguards, play area for children, sports area, good disabled access, beach bars and a promenade with restaurants. There are also two yacht and diving centres. El Paradis beach, Villajoyosa – This is a beach offering over 1km of golden sand with areas of gravel. It has a Blue Flag award. Facilities: Red Cross, Lifeguards, parking, campsite, sports area, children’s play area, beach bars and restaurants. There are pontoons (rafts) to swim out to for diving and sunbathing. A great place for water sports too. Other great beaches in the Villajoyosa area are the town beach, El Centro (Ciudad), which is a sandy beach lined with a promenade decorated with palm trees, and L’Esparrello beach, which is in a secluded cove favoured by naturists. 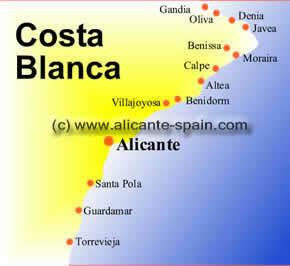 There are many other wonderful beaches on the Costa Blanca, including the Calpe beach. Nudists should visit Arenal beach near Javea, Cabo de Las Huertas near Alicante and Raco Conil beach which is about 4km from Benidorm. A further look on other great Spain beaches, especially for the southern Costa Blanca Spain beach area and the Torrevieja beach can be found here.